We all know what happened to the famous egg that was so fond of heights. His ultimate downfall was a real mess. Here's the thing, wouldn't it be so much creepier if Mr. Dumpty was a baby doll? There's nothing more bone-chilling than broken and abandoned children's toys. It's a sure fire way to make people shriek in a pan shot during a horror movie. You know those little China dolls lined up on the supposedly innocent nursery bookshelf are sure to come back into the plot sooner or later. What's worse than hearing the pitter patter of porcelain feet while the shot only shows the main character sleeping with one hand dangling off the bed? Here's a tip, if you're sleeping in a house of horror keep all your limbs securely tucked to the safety of your Sleep Number mattress! If you're looking to become the nightmare-inducing star of your local haunted houses. 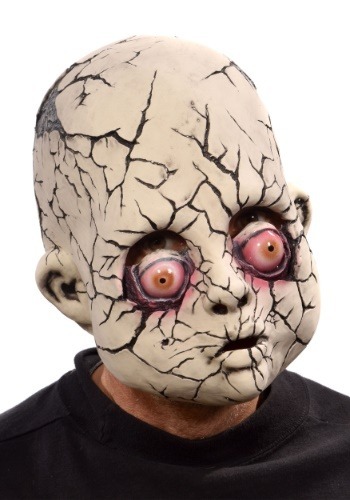 This mask has a horrifying cracked appearance, has red, watery eyes and has holes for sight over the dolls eyes. It slips over the head and is made of latex for a comfortable fit. For full effect, pair it with one of our baby costumes or an unhinged clown costume and bring everyone's horror movie fears to life. It's about time that you brought back the scary into Halloween! Spooking has never been so easy. All you need to do is let out a "Gaga" from a dimly look corner and watch the terror unfold. Your place is not a crib we'll be visiting anytime soon!